INNSBRUCK’S LOCAL MOUNTAIN EMINENTLY TOWERS OVER THE TOWN AND HARBOURS A NUMBER OF WELCOME SURPRISES NONETHELESS. When you ask what Innsbruck’s local mountain is, occasionally the answer is “Patscherkofel” where Austria’s alpine racing hero Franz Klammer claimed Olympic gold in downhill. Sometimes the answer is the rocky pyramid known as Serles, which guards the Brenner Pass. Yet no mountain in Innsbruck is as impressive and omnipresent as the Nordkette. Considered too steep for an ordinary ski area for far too long, the gondola—reaching to the Hafelekar summit looming above the city—was initially built as a summer attraction. These days however, this gondola is the main reason a hefty amount of freeride pros, not to mention a hoard of students, have flocked to Innsbruck. To travel from the town centre to the peak of the Hafelekarspitze can take less than half an hour in ideal conditions; ideal for a quick morning shred before class or an active lunch break. 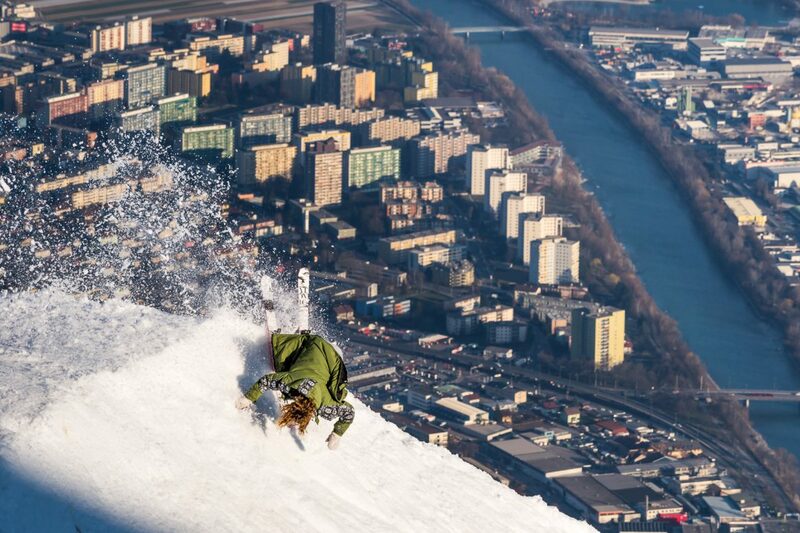 On a powder day however, you’ve got to plan differently to score. If you missed getting up early to line up well before the first gondola, it pays of to dip into “Hitt und Söhne” next door for a coffee, to make a plan of attack while the line of impatient froth-heads diminishes. Even on packed pow days there are plenty of opportunities to find an untracked line on the Nordkette, yet you should definitely know what you are doing when moving in this terrain. It is steep and avalanche prone pretty much everywhere and—depending on the snow conditions—the hidden runs involve a decent walk to the nearest bus station on the valley floor. If, however, you’ve managed to claim a spot in the packed first gondola, a real freeride dream awaits you: steep open faces that only end after a few hundred vertical meters in a traverse to the Seegrube chairlift or—if you’ve really scored a perfect day—continue with epic tree runs all the way to the bottom of Hungerburg gondola. Sadly the Karrinne couloir, the Seilbahnrinne couloir directly under the lift and the Südhang under the gondola station are completely tracked out within half a day. Even the extreme variations of these descents—of which there are quite a few when the conditions allow—don’t have to wait long to find an interested customer. Luckily there is a widely spread rumour that the Nordkette is only good for freeriding when there is fresh snow. 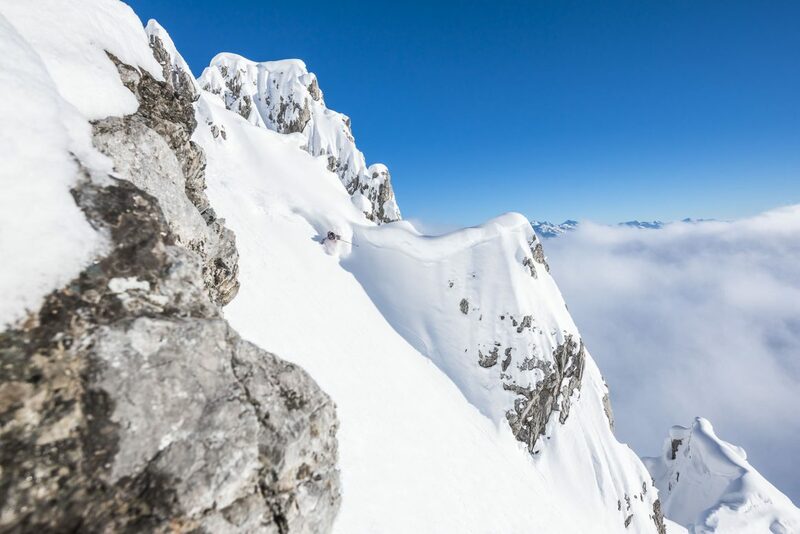 Particularly when all the faces have been shredded to bits and the sun as worked its magic—turning ice into soft corn—the terrain offers fun and challenging possibilities; a particularly perfect training venue for ambitious freeride competitors. Those able to go full throttle to tame this terrain will have a definite edge in the many freeride contests that occur in less than ideal conditions. On days like this, the slopes are often empty and present the perfect opportunity to feel the rush of hammering at speed, as long your quad muscles can handle it. Those with enough knowledge and experience bring their touring gear and use the Hafelekarspitz as the entry point to the north facing Karwendelkare which can store a reserve of powder for weeks even when its T-shirt weather in Innsbruck. The Nordkette is not just a freeride Eldorado, jibbers of all ages claimed their slice of the Seegrube quite some time ago. There even used to be a halfpipe, where the occasional snowboarder used to prepare for the Olympics. Meanwhile the Halfpipe, as well as the slopestyle training course of the Austrian Ski Federation, has moved to Kühtai which has more space on a north facing slope. Yet this has opened the field for non competition orientated skiers, to jib and jump all day to their hearts delight. The Skyline Park may not be long, but it has chill vibe, sports a number of super fun obstacles and has the occasional special features built by a dedicated park crew. Keen to continue innovating, the park crew is trying a new approach this season. Inspired by the Blank Canvas shooting with the Atomic team two seasons ago—where Jossi Wells & co. designed and built their own shooting obstacle out of a mound of snow—the mountain management handed out blank park plans to all the local ski and snowboard crews. This gave the riders the chance to let their own creativity run rampant and the best ideas will be realized one after another over the space of the season. The jib community is thus blessed with innovative and ever changing setups. So the question remains, is this a spot that is only of interest to locals, or is it worth travelling here for a ski mission? The answer is simple: it’s always worth visiting the Nordkette and definitely worth staying for a while. Innsbruck is super easy to reach and offers a wide range of accommodation options not to mention a vibrant nightlife and a hefty concentration of ski and snowboard culture. Cloud9, the igloo bar right next to the Skyline Park plays host to a club night every Friday from 18:00 till 23:00 with international DJs. Alternatively, you can get your après Ski fix any day at Hitt und Söhne directly next to the bottom gondola station. Throughout the whole city you can always find exhibitions, premiers, concerts, parties and more, there’s lots to discover. And the longer you stay, the higher your chances of scoring a really magical day on the mountain over looking the city. Really, the only remaining questions is, when are you coming? 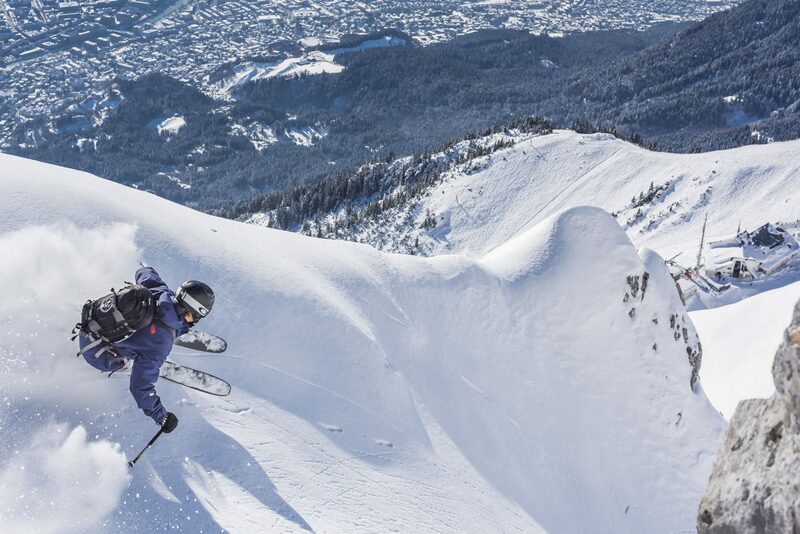 Come and discover one of the best and most versatile “little” ski areas in the world. Also known as the Inntalkette (or Inn Valley Chain), the 10 km long mountain chain is the southernmost and shortest of the four mountain ranges of the Karwendel. Accessible with the Nordkettenbahn, the Hafelkarspitze reaches to 2,334 m and is directly north of Innsbruck, around about in the middle of the range. The highest point is found in the west, on the Kleinen Solstein at 2,637 m.
You can easily reach Innsbruck from all directions via the Inntal- or Brenner Motorway, or the corresponding railways that follow the same route, as well as the international airport (INN). From the centre of town the Hungerburgbahn funicular travels up to a plateau that is 850 meters above sea level directly beneath the Nordkette. From here, one gondola ascends to the Seegrube and a second continues to the Hafelekarspitze. You can also reach the bottom station of the Nordkettenbahn with the bus or car. The Nordkette is known for many heavy snowfalls that can deliver stunning powder days early and late in the season. Due to the south facing aspect, however, the best conditions are usually found in January or February. Founded by the entrepreneurial freeskier Bene Mayr, “Hitt und Söhne”, located directly next to the valley station of the Nordkettenbahn gondola, is a combination of café, bar and shop. Open between 10:00 and 19:00 it is the perfect meeting place or après ski location. A cosy but modern location that serves a banging coffee, tasty snacks and great drinks; not to mention the chance to browse and buy a quality selection of freeski products.